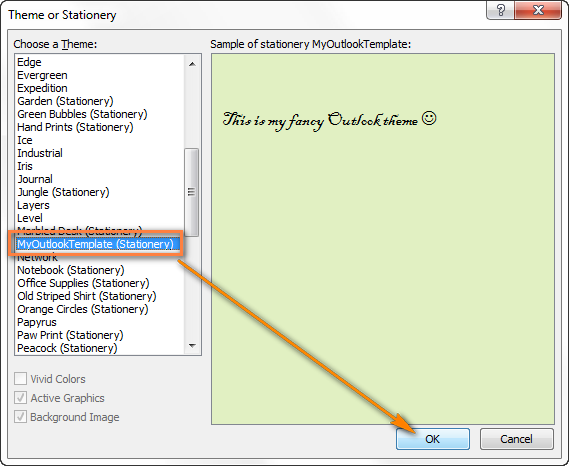 The tutorial explains how to create, save and use standard Outlook email templates. You will also learn how to reply with template in Outlook 2019, 2016, 2013, and 2010. Outlook e-mail templates is a really powerful feature, though often underestimated. Rather few people know that templates for Outlook emails exist and even fewer know how to create and use them the right way. Imagine how much time you could save if instead of typing the same text over and over again, you would simply click on a template and a nicely formatted e-mail message with pre-verified and therefore always accurate information is ready to be sent! 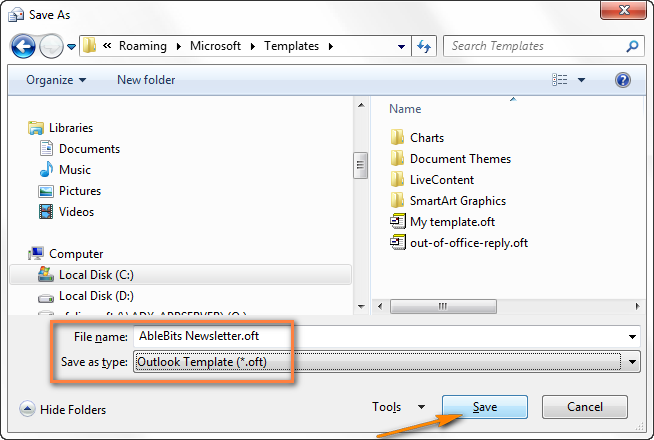 This section explains how to create and save email templates on an example of Outlook 2010. In Outlook 2019, 2016 and 2013, it works exactly the same way, with maybe some insignificant differences in the color scheme and design of the Outlook ribbon. Compose a new message in the usual way (Home tab > New E-mail). Be sure to add all the details you want to save in your template, such as the body text, subject, attachment, recipient address if needed, and so on. Switch to the File tab and click the Save as button. Select Outlook Template (*.oft) from the Save as type drop-down list and give your new template an appropriate name. Tip. In the same way you can make a template from any existing e-mail message that you either sent or received. Just open it from your Outlook folder, say Sent Items, switch to the File tab and click Save as. Navigate to the Developer tab and click the Choose Form button. Note. In case the Developer tab is not present on your Outlook ribbon, right-click anywhere on the ribbon, and then click Customize the Ribbon... This will open the Outlook Options dialog and you select the Developer check-box in the left pane. The Choose Form dialog box appears, and you select User Templates in file System from the Look in drop-down list. This will display a list of all the e-mail templates you currently have. Select the needed one and click Open. That's it! A new message will be created based on the chosen template, with the same body, subject, formatting, images etc. To modify an existing template, open it as an email message (as described above) and make the changes you want. After that save the template under the same name again as described in Saving an Outlook template. Done! If you frequently use one or more templates in your work, navigating to the Developer tab each time may seem quite a long way. In this case you can create a shortcut and place it on your desktop or pin the template to the task bar. The latter seems even a better option, so let's go ahead with it. Find the needed one, select it and drag towards the Outlook icon on your taskbar. This will pin the template to the context menu of the Outlook icon. Next time you need to need to e-mail with template in Outlook, right-click the Outlook icon on the task bar and choose the template you want. As shown in the screenshot below, you can pin several templates that you use most often. 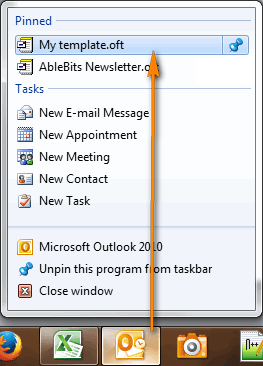 If you don't want a particular email template on your task bar any longer, right click on it and choose Unpin from this list. 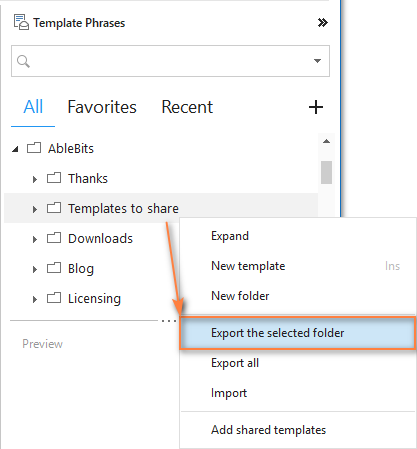 If you'd rather have a template shortcut added to the desktop, then open the folder with your Outlook templates, as described in step 1 above and select Send to >Desktop. This will create a shortcut on your desktop and you click it whenever you want to create an new message with this template. 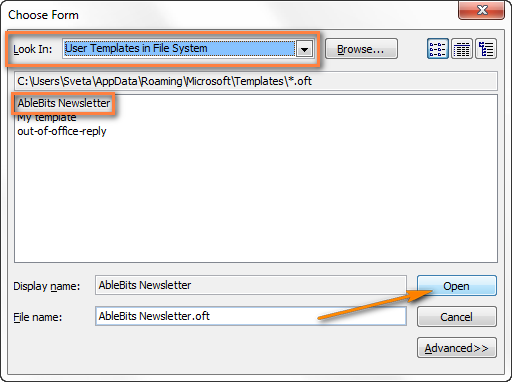 An Outlook template is a usual file (.oft), so you can pick any template from the folder where all Outlook templates are stored (C:\Users\UserName\AppData\Roaming\Microsoft\Templates) and send it as an al attachment or save to a network share. If you want to use a specific template for all new emails, then you have to create an HTML template first and then set it as your Outlook email theme. For example, you may want to use a particular font or background color in all email messages that you send. Design your email template and open it as a regular email message. Switch to the File tab, click the Save As button and save the email as an HTML file to the Stationery sub-folder of the Microsoft folder. On Vista, Windows 7, Windows 8, and Windows 10, this folder is located here: C:\Users\UserName\AppData\Roaming\Microsoft\Stationery. You can also design your Outlook e-mail template using any other HTML editor and save the resulting html file to the same folder. 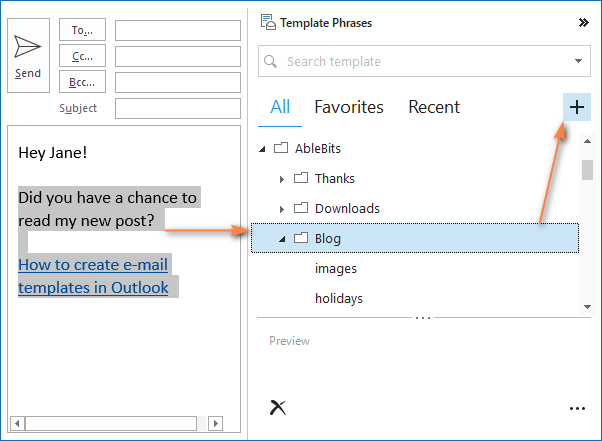 To set the newly created template as your default Outlook email theme, go to the File tab > Options > Mail > Compose messages section and click the Stationery and Fonts button. 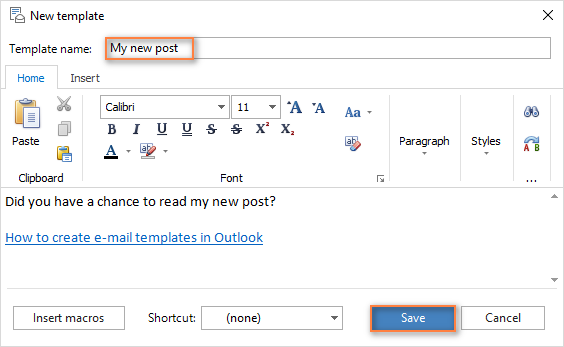 Find your email template in the list of Outlook themes and click OK to set it as the default email theme. 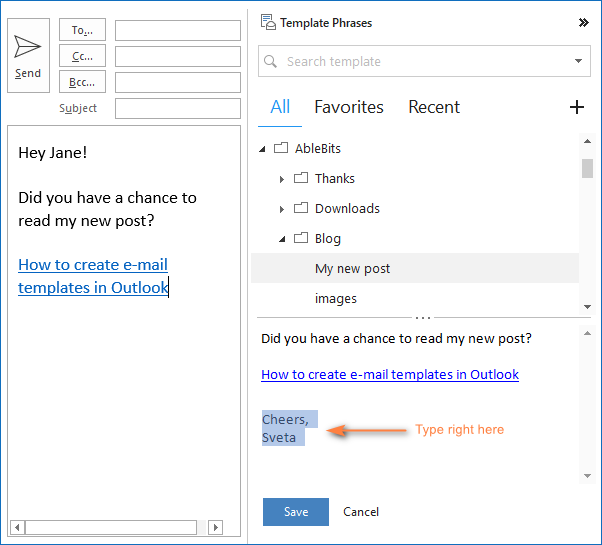 From now on, your new Outlook email template will automatically be applied to all messages you are composing. Where do I find free email templates? Surely, Outlook templates provide many useful features that can save you a lot of time. But if you send tens of repetitive emails daily, the capabilities of built-in Outlook templates may not be enough. For example, what if you want to reply with template in Outlook? And if you've created a few dozen templates for different occasions, how could you view their content to pick the best-suited one? And if you could only insert a template in the message with a mouse click! Sounds like a wish-list for the Microsoft Outlook team? 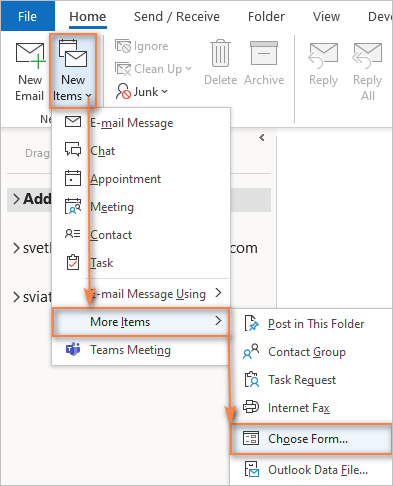 :) No matter how fantastic it may sound, all these features are already implemented in our own templates for Outlook emails, and the next section shows how to use them. Are you looking for Outlook email templates that can be used at any time with any message type including new e-mails, replies and forwards? Then you'll surely find our Template Phrases for Outlook very useful. It does do not require switching to other tabs, creating desktop shortcuts, and the like. You can make, inset and edit a template directly from the e-mail message window. Like build-in ones, our mini-templates can include text, graphics, tables, signatures, hyperlinks and formatting. All versions of Microsoft Outlook 2019, 2016, 2013, 2010, and 2007 are supported. A free version of Template Phrases for Outlook Online is also available. Once installed, the plug-in adds a special pane to the right-hand part of your e-mail window that shows your own catalog of email templates grouped into folders and sub-folders. The content of the currently selected template is displayed in the preview window. If you don't want to see the Template Phrases pane when composing a message, click on the chevron button at the top right-hand corner and the pane will minimize to a small vertical strip. In an e-mail message, select the content you want to add to the template. On the Template Phrases pane, select the target folder and click the Plus icon or press the Insert key on your keyboard. The selected text is automatically added to the body of your new template and the first few words become its name. Text formatting, links and images are fetched and preserved. You just edit the template name if needed and click Save. Nothing can be easier, agree? To make a few quick changes, type directly on the preview pane, and then click Save. Or click the Edit button at the bottom of the preview pane, and then make use of the extended text and formatting options in the Edit window. I know that many Outlook users have an innate fear of macros. Please don't be afraid, in this case "macro" does not mean writing VB scripts. Template Phrases has a predefined list of macros that you can insert in your Outlook email templates to automatically attach a file, fill in To, Cc, Bcc and Subject fields, insert a recipient's name, and more. ~%INSERT_RECIPIENT_FIRSTNAME to insert the first name of the recipient. ~%FILLSUBJECT= to fill in the Subject line with the text you specify. ~%ATTACHFILE= to add an attachment. For more information, please see How to use macros in your email templates. Double-click the template on the pane (my preferred way). Select the template and click the Paste button. Right-click on the template name and choose Paste from the context menu. Type any part of the template name in the Search box, say "post". This will display a list of all relevant templates that contain the search word. Tip. You can assign a shortcut to your most frequently used templates and have them inserted in a message by pressing, say, Ctrl + Shift + 1. Put all the templates you want to share into one folder. Right-click that folder, and then click Export the selected folder. Choose where to save the exported folder and you are done! Please note that it was only a quick introduction to Template Phrases. After experimenting a bit, you will discover a lot more useful features! 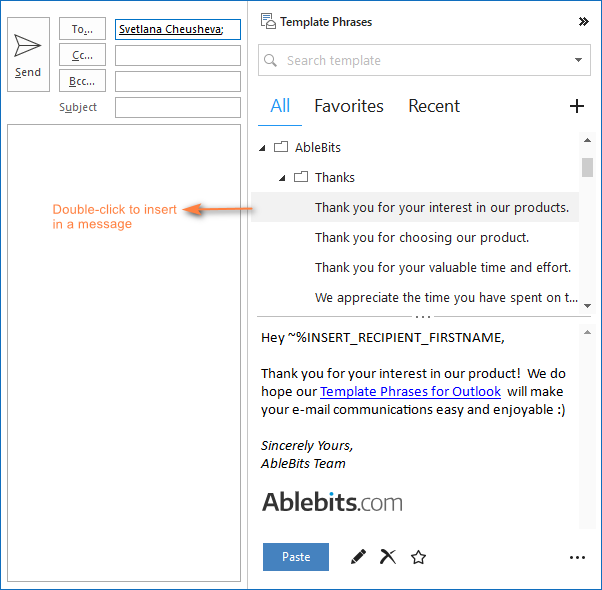 Currently, Template Phrases is part of our Add-ins Collection for Outlook, and a trial version can be download here. Thank you for reading and hope to see you on our blog soon! Quick Parts - reusable pieces of content that can be inserted into emails, meeting requests, appointments, contacts and tasks. Outlook signatures - almost everyone uses email signatures to display contact information, but who says they have to be limited to standard details? In theory, you can create multiple signatures as entire email templates. 110 Responses to "How to create and use e-mail templates in Outlook 2016 and 2013"
I would like to add my company logo so that it appears in the top left corner of all of my emails and doesn't move. I can add it as a new stationery option but when I tab down from the subject field, the logo moves down as well placing the cursor above it. Any suggestions? This definitely can be done. But we need to see the html code of your template to be able to say what exactly changes need to be made. If you can send us (support@ablebits.com) the .html file of your template from the Stationery folder (C:\Users\UserName\AppData\Roaming\Microsoft\Stationery), we will try to help. Hi, i'm looking to do something very similar by adding a hyperlinked image to the top right hand corner of all new mail but again it moves down when i click on new mail. Can you let me know what to do? How can I convert HTML file into Outlook 2010 template?? You just need to save your HTML file to the Stationery folder (C:\Users\UserName\AppData\Roaming\Microsoft\Stationery). Thanks a lot, I have done setting default template back in 2012, but no idea, no matter how I thought I didn't remember. But this forum solves this dilemma. I tried and I am able to find my custom theme listed in theme section in stationery. But when I tried to set bullet for my listings, it doesn't take my custom bullet. Any idea? It's hard to diagnose the root of the problem remotely. You can send us your custom theme file from the Stationary folder at support@ablebits.com and I will do my best to help you. Regrettably, this is not possible with standard Outlook email templates. Advanced email templates (Template Phrases for Outlook) described in the 2nd part of the article provide such capabilities. You can use macros to fill in To, Cc, Bcc and Subject fields. Also, you can use the following combination of 2 macros ~%WHAT_TO_ENTER[~%SUBJECT] to insert a subject or its part into an email. Every time you click the template to paste it into an email, you will see a dialog box with the subject text to be inserted, where you can remove some words and make any other edits. These edits will be applied to the subject's text inserted into the message body only, the Subject per se will remain intact. I am afraid Outlook email templates are not well suited for this purpose. You can check out the Mail Merge features. The above article describes how to do a mail merge from Excel to Word, but you can merge with your Outlook contacts list exactly in the same way. As an alternative, you can consider using some personalized software for Outlook such as Easy Mail Merge. I often am on a web site, click on something that tells me this is how to contact the organization and then an Outlook HTML E-mail form pops up with a send address in it. I write my subject and compose my message and then............ I cannot figure out how to send it. I did read somewhere that Ctr Enter would do it, but it doesn't work. I have never heard about such problem before. When I click an email address on some web-site, I always see a normal Outlook message window with the Send button. 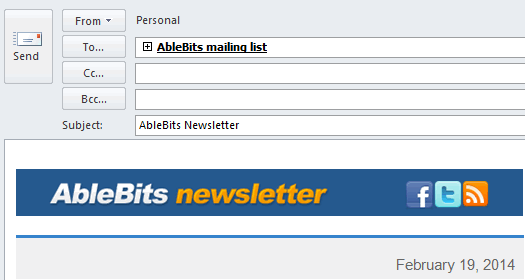 Anyway, for us to understand the problem better, can you please click our support address (support@ablebits.com) and then send us a screenshot of what you see? If the "send" button is not visible, try to check if your email account is properly configured in your outlook. You can try this by opening your outlook and composing an email from scratch. See if you can send from there. You can also see if maybe the send button is hidden from your toolbar. I have followed your instructions completely and created my template and saved in the right location. However I can run the form and open it up perfectly but when I send it to myself to test it I receive the email but with no text that I typed in at all. I have checked to see if the text box was enabled and visible etc which it is I just cant seem to fathom it out - any help would be greatly appreciated. It's very hard to diagnoze the root of the problem without seeing your template. If you can send it to me at support@ablebits.com as an .oft file (C:\Users\UserName\AppData\Roaming\Microsoft\Templates), we will try to figure this out. You can remove any sensitive info, if any, and leave only the formatting and some sample text. I have sent you the .oft template that I am using. There is no sensitive information in it. If you could have a look at it for me then that would be great. You have created a very complex form, we are really impressed! I consulted our Outlook guru and he spotted a couple of issues that need to be fixed. I emailed you the details a few minutes ago, hopefully the information will be helpful. You and your gurus have worked wonders - the form works perfectly now. I am also facing a similar issue in my environment as Ryan in my Outlook 2013. I have Windows 7 with office 2007 and some with Office 2013. The Forms works perfectly on Outlook 2007 but not in Outlook 2013, when we reply back to the user the message content is empty. Could you please send me the steps to help resolve the issue. Thank you for this clear, concise and applicable tutorial. After looking at, and attempting to use, several other tutorials, your was a breath of fresh air. Thank you very much for your feedback, Tabitha! I am really pleased to know you liked it. I want to create a template and have a file attached to it so I don't have to attach it each time I use it. Can this be done? I do not know a way to do this with standard Outlook email templates, but you can easily create such a template with Template Phrases for Outlook add-in. 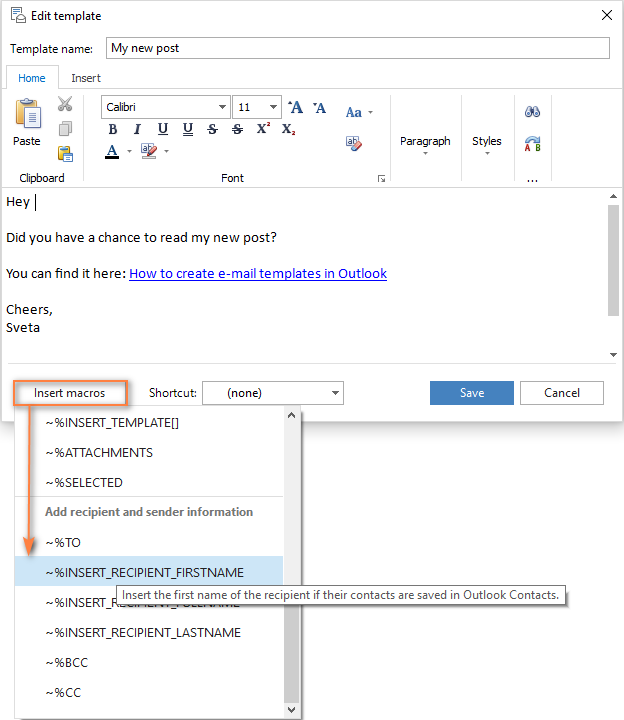 Please see the 'Using macros in Outlook email templates' part in this article for more details. Your directions on creating the template has been a huge help; particularly as we have 6-8 different emails that must be sent upon hiring of new employees! I atached a file to the email (before I saved it as a template)and, when I opened the template, it was still there. My only question is this: If we make a change to the document (that the attachment is pulling from), when we send a new email (using the template), it still has the original file attachment, not the updated version (which we "saved as" with the same file name. It appears this attachment is static and does not pull "live" from the source. Do you know if this is the case? Is there a way around this? May I ask you if it would be possible to have a email template with different tabs? So I can use it for sending out information of different vendors in the same email. Regrettably, it's not possible to create an email template with tabs either with standard Outlook templates or with our Template Phrases add-in. The Template Phrases provides 'What to Enter' macro that prompts the user to enter some specific text in each message whenever the template is applied, though I am not sure this feature is fit for the case. Thank you Svetlana for your feedback! It is a shame we cannot do it. I have a custom email template with cells and rows. I have images I have inserted into some of theses cells and am having trouble setting the positions into these cells. is there an easy way to position and lock the images into these cells? center of the cell? top left corner? left margin-center of the cell? while locking them into position? i can drag the images all around but this a manual process and the positions are not necessarily uniform. thanks in advance. From our own experience with sending newsletters, there is no easy way. Different email clients behave in a different way not complying with standards, and regrettably Outlook is not an exception. To be properly positioned, each image requires specific CSS styles. We do not know any way to do this via drag-n-drop. Hello. I have multiple Outlook profiles and when I add the stationery to one profile, it is using that for my personal work profile as well. 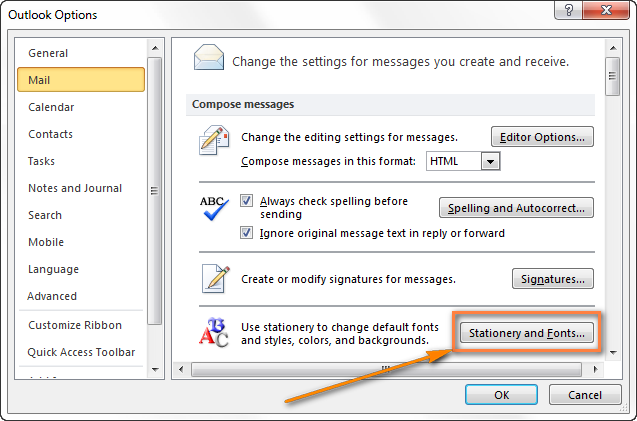 I don't see a way with Outlook 2013 to assign the stationery to a particular email account, like you can with a signature. As far as I know this is not possible because Outlook signatures are account-specific while Outlook theme (Stationery) is global. I have created a form in Word 2013 using the developer tool. Followed all instructions I can find on inserting it into outlook in order to create an email template. Not for the life of me will the form work. PLEASE HELP! ... or if I can insert this form into gmail that would be better. Is this at all possible? Oh, the form works perfectly fine in word. I'm very sorry but I am unable to help with this issue because I have no experience with Word forms. You can probably post your question on http://www.answers.microsoft.com, hopefully someone will know the answer. ive managed to create oft email template file and saved it. but unable to share it with my colleagues, how can do this? Please clarify what exactly doesn't work: you can't attach the .oft template file to email or your colleagues can't add your template to their Outlook or something else. I have a business partner who wants to save the template so that it is coming from a specific “From” email address. When we try to update it in the “From” menu, after we save it and try to open it again, it’s reverting back to my own email address. A standard template doesn't store the contents of the From field. You can create an Outlook macro to automatically add addresses in the From field to a particular template. Or you can try our Template Phrases add-in for Outlook. It can fill the From field as well as other email fields. I have created a custom email template with custom fields to be filled out by my sales force. However somewhere along the way I do not have the ability to attach any files once I run the template. I am using 2007 and not sure what I am missing. When I try to use standard email fields, the attachment shows up a check box? Thank you. I created an email newsletter which contains a lot of images... Most people who open it up and read it on their desktop with Microsoft Outlook say it looks fine, however some people who open it up in Microsoft Exchange OR Microsoft Outlook on their smart phone (BlackBerry) have a ton of "attachement files" just show up! How do I get rid of those? Anybody know? Template can only made in Outlook 2010 and 2013? Mine is 2011. My Save As item is useless. FYI: I had to find the file in Windows Explorer to drag it to my task bar. It would not budge from the Outlook template window. Right click also produced no menu. Sigh. A proprietary format. Thanks for nothing Microsoft! I have a client using Outlook 2010 who wants to have an email template made. The catch is that he does not want certain content in the template to be editable (both images and text) -- his plan is to share this email template with co-workers to send out from their own accounts, but he does not want them to change or delete parts of the content by mistake. Is there any way to "lock" content in an Outlook email template, so that when a user opens a new email from the template, they can't edit designated sections? I regret to tell you that it is not possible with with standard Outlook templates. Our developers will do some research to investigate whether it is possible in principle. If if is, we will try to implement this feature in our add-in. Do you have an affiliate link I can put on my web site? Our support team emailed you the details, thank you. 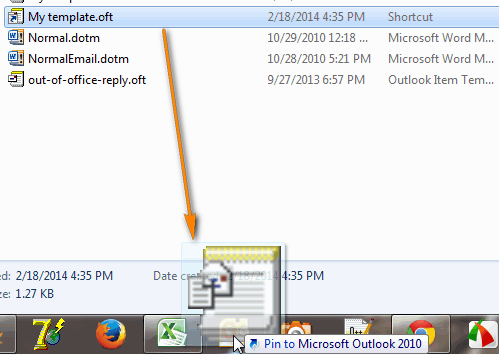 I have created outlook templates before using this method and it has worked perfectly. Today when I have tried to create a new one when I go to save as there is no "outlook template oft" available to select in the "save as type" field ... its just disappeared .... Please help ?? It looks very strange, this option is always available when saving a message. Sorry I have no idea why it happens. Try restarting Outlook just in case. If it doesn't help, turn to Microsoft support service http://support.microsoft.com for assistance. Great help! Thank you very much! Please help, I have designed a letterhead stationery in Outlook 2010 for our company using various textboxes containing text relevant to our company details etc. It looks fine when I send it and print on my side but on the recipient side the textbox outlines appear as grey boxes. How can I get rid of this? Similar to Tosca's issue, the formatting of a saved template I'm using is different when received. I saved an Outlook template within my stationary folder as an oft., but the table in my template is spaced differently on the recipient's side. What am I doing wrong? I want to use this template for monthly newsletters, but it needs to look professional. The issue may occur if the sender and recipient have different versions of Outlook. Kindly Advice, I have two accounts in outlook 2013 (office 365 as Microsoft Exchange & Outlook.com as IMAP). 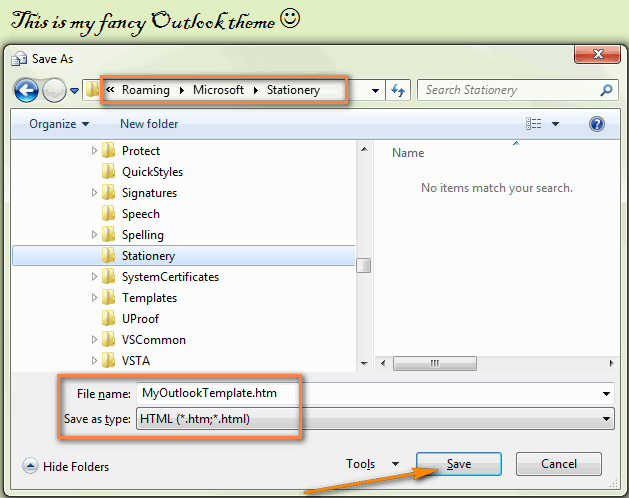 I have created & saved template, in the from field i selected outlook.com mail ID. I also created a reply rule pointing to this template & applied this rule to a specific sub-folder which is under Inbox in Outlook.com account. The problem is it sends these mails from Office 365 account Outbox. I suppose due to it being default send account. But in that case kindly help me understand what is the purpose of selecting "from:" field in the template when outlook is clearly ignoring which account i want to send these email from? Is it possible to have a standard template so that when i click reply to a message it automatically comes up without me having to do anything else? I have created a template for new messages but would like to use this when replying to incoming messages. The solution I've come up with is creating a folder containing the generic email template. When I'm ready to use, I highlight that email in that folder, then click a custom quick step that copies that file to the draft folder. I then click Draft folder then click my newly copied email template. Make proper adjustments (as necessary) then send. And email template in template folder remains for the next job. I would like to make a template that generates a unique email sequence number in the subject field, so everytime I use the template the subject is prepopulated with a standard subject tha includes an email number which is 1 number higher than the previous email sent (n+1). Is this possible? at the moment we have to keep track of the email number in a spreadsheet and populate a new number every time. myTemplate.Subject = "Test " + "2"
I've created a form with an attachment. But I want to be able to turn an existing email into that form, not just open a new email of that form. Reason being I have an extensive contact list where I click to send a new email to each contact. Then I want to turn that new email into the form with the attachment. Is this possible at all? I cannot download the Templates add-in at my company. Is there a macro that would attach the same file and input the same text into an existing email? I don't know how to write VBA either. Thank you. I've found and using regularly MailStyler since february. I make my template then import it somewhere else. Great features, although is still young (I believe it went live on November, 2014). Hello - Is it possible to create within an email template a drop-down menu for the Subject line? Also, is it possible to have an email address automatically fill the blind copy (BC) line? Sorry, we don't know how to do this. Most likely VBA code is needed in this case. Hi- Is there a way to protect/lock 'Subject' of an outlook email to avoid editing when others reply. You need a custom solution, like an add-in for your task. I Have made a HTML Stationary template and signature through Outlook, which are both working find, as long as the email is opened on a desktop computer. If the emails are opened through an email app (i.e. on an iphone), all the formatting is wrong, and images that have been used in the header and signature all move, making the email template look very sloppy. How can I set my template and signature to adjust to which ever device the receiver of the email opens the email in? (i.e. So that if they open the email on an iphone, the header is still centered, etc). Please send us your template at support@ablebits.com to see what can be done. I am having the same problem, all the font on a smart phone becomes very compressed. Is there a way to fix this? I would like to have an e-newsletter template that maintains the same side to side dimensions as the Word document I use to craft the newsletter content with photos. 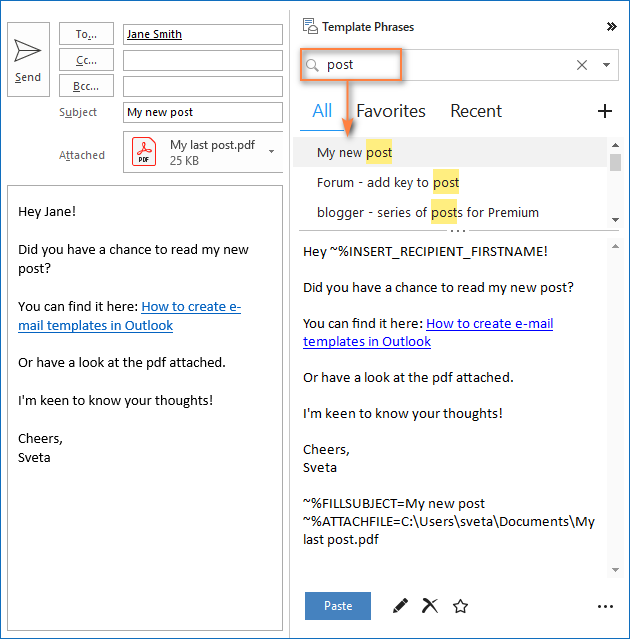 When I paste my content into an Outlook 2013 email message box without a template format, the text can spread as widely as the computer user's viewing screen. Is there an Outlook newsletter template that will limit the width to preserve the layout AND still allow functional links to webpages? A jpeg or PDF version will preserve the Word document but does not allow for functional web links. I believe I could create something in Constant Contact newsletter formats, but doing that disallows my easily using my flexible Outlook address book for allusers, list that changes on a regular basis. Can you tell me why the "save as..." option is greyed out and unavailable in Microsoft Office 2011 and Microsoft 365? I have the most recent update in the latter (2016), and it's still unavailable. Can you help with this please? I have created a form that allows users to 'tick' questions. So far it's quite a simple form: I've attached the tick boxes to personalised fields but now I want to collate the responses just like voting buttons. Can I do this without needing MS Access (which we cannot have in our organisation)? Looks like you need VBA to accomplish your task. Sorry, we cannot help you with this. Seem all features are fantastic, but I still have to commit which Im very willing to enjoy them. I don't want a set of stock formatted content in new email messages. I just want to override the default styles that Outlook uses in new email messages. For example, I want to define the hanging indent, tab stop, and Spacing Before the paragraphs when the Bullets ribbon tool button is used to add bullets. Even if I leave one bullet in the stationery template, using this button to add a bullet to a paragraph applies the Outlook default 0.25" hanging indent with a 0.25" tab stop, and no spacing before. How can these deeply-embedded defaults be changed? Please try to change the Normal style. In a new email go to Format Text tab -> Styles -> right-click Normal -> Modify. Select all the necessary styles and select New document based on this template. Click OK to finish up. I have created a oft. template for new messages which works well. But I would like to use this same template when replying to incoming messages. How do I do this? Thank you for a great article. I have created a template and saved it as an html file in the stationery folder. The template incorporates an image in the top right had corner and when i open a new email the whole template is moved several rows down leaving a gap at the top of the email. Any suggestions on how to resolve this? Line #2: Type able text on a grey background. And whenever there's a huge text, the grey background should increase in size accordingly). Is this possible in Outlook? Anyway to get this them setup to include a specific address in the CC line? When I add a CC address and save the HTML, once I select it as a theme, it converts the CCN line to text in the body of the email. I've created a template using the outlook platform but it cant be viewed on iPhones or Macs. Is there a way we can make the template compatible with these systems? Your instructions are very simple to follow, thank you. However, what I am wanting to do is not listed. I work with veterans so I want a patriotic background to my emails. I have a nice stationary I would like to scan to use as a background/theme. I can't figure out how to do it. Can you help? Also, Some of the MS stationary preloaded is like a background where you can write over the top (ie.. the bears), but what I load want let me. How can I save a stationary that is just a background. Lastly, How can I use/make borders for my stationary. This is great, however what I am wanting is very similar to this but in calendar instead, with appointments. We schedule all our work through outlook calendars which our employees can access on their phones (at the office we have control over all their individual calendars). Our employees note all the details of their jobs in the notes section of the calendar appointment and what we need is a template when creating the appointment so it is logical and they don't forget to record any of the job details. Is this possible? Also I tried all your instructions as a practice run and when I went to re-open the email template and I got to C:\Users\UserName and there was no "app data" file. Do you know why this would be? Can I create a template from a shared calendar in Outlook 2010? Hi, I created an oft.-template and want to integrate a macro, so the first line will include the name of the recipient. I want to use ~%TO as suggested on your homepage. How is this possible? Greets from Germany. I just updated our shared templates for 2017 and when I import them on my colleagues computers all of the hyperlinks that are in the templates I created are gone. Please advise. Our support service assistants will try to help. Thank you. When I save a Outlook template (.oft) with a Japanese subject, it is not retaining the subject and is converting it to "????". How can I get it to keep the Japanese characters in the subject? My team has to send large number of email notification per week. I looked at creating group for each category and asked them to send. But there is always element of missing few groups, or not able to send the weekly reminder, how can i automate sending emails every week. I have a problem showing a Text on a background I used vml technique but it didn't work only 2007 and 2010 but 2013 half of image appear and I need to lick over to load all the image any one could give a hand. I really like the blog and I think it truly enhances the techno community. I very much like this blogs and I think it really enhances to think. I have a image i can send as a New template, but i am unable go with macro for reply, reply all and forward. Can anyone pls guide me with macro. Could you please guide how to design the below template ?. I want to design a email template for IT monitoring of the services. The email template should contain below headings with tab in horizontal dimensions. Could you please guide me how to achieve this ?. I just want to create a template with some time changes in the outlook. I want to know if it is possible to show the real email address an email is sent to. A sender sends an email to address test3@test.com. Outlook displays the primary email address as receiver for the recipient . I would like to have a outlook form that shows the actual email address the email is sent to. I have built a form however when I send it to others I couldn't view the content of the form and just dispays the subject of the email. What if I want to turn emails I receive into custom task forms? My team and I receive hundreds of requests each day and I would like to quickly organize them using custom fields in tasks. I have added the custom fields to the task view, but would like to know how to update a field on multiple tasks at once and also how i can update those fields from the email itself when i receive it. So if I receive an Email for Customer A and I have a Customer field in my task view, how can i open the email and enter "Customer A" in the email itself to populate this field?